A Kiss Goodnight should be on your shelf and in your heart. 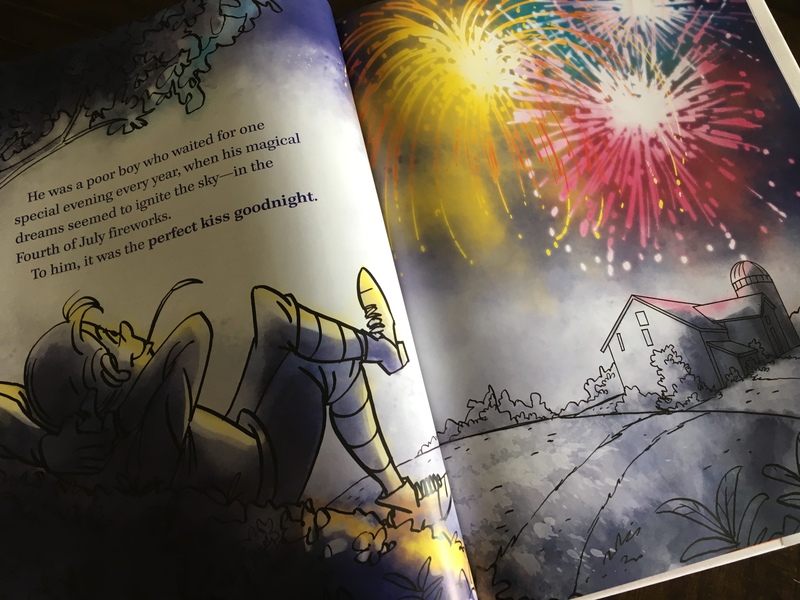 This beautiful picture book is simple enough to be read to children as a bedtime story, but filled with enough nostalgia and memories to be enjoyed by their parents over and over again. Every Disney fan will want this for their collection once they realize the story it contains and the special treat inside. 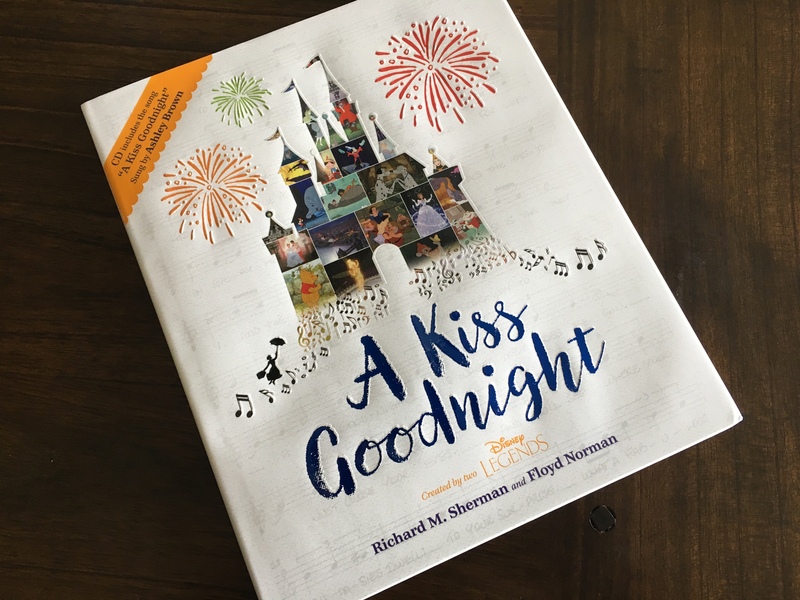 Yes, every copy of A Kiss Goodnight includes a CD with a recording of Richard Sherman’s song performed by the lovely Ashley Brown. But what will really hook you are the beautiful illustrations by Floyd Norman which bring the story to life in abundantly colorful ways. Richard Sherman, as most of you know, is one half of the famous Sherman Brothers who composed such brilliant music and songs for films like Mary Poppins and The Jungle Book. But their brilliance didn’t stop there. They are also responsible for such toe-tapping tunes from attractions like The Enchanted Tiki Room and Carousel of Progress. If you’ve found yourself with an earworm after hearing “The Tiki, Tiki, Tiki, Room” or “There’s A Great Big Beautiful Tomorrow,” you have them to blame. And of course their most famous creation, “It’s A Small World (After All).” Richard was inspired when he heard the story why Walt wanted fireworks at Disneyland and had to write a song to tell that story. But he did more than write a song and with his fellow Disney Legend, Floyd Norman, they created this book to better share that story. Floyd Norman has contributed to the Disney legacy in many different ways – as an animator, a story artist, and part of the story team for such films as Sleeping Beauty, Robin Hood, Mulan, Toy Story 2, and Monsters, Inc. just to name a few. But even if you didn’t know him at all, the artwork in this book would make you smile. It is just so beautiful and filled with color, light, and expression you will almost feel transported to the places Richard describes. Love this image – and thought this was the ending to the story only to find out there was more! Walt is curiously never mentioned by name in the body of the story, but the boy is most certainly him. Walt’s distinctive look alone would give that away, but also Richard tells about the story’s inspiration in the opening introduction. It took something away from the narrative not to mention Walt by name. I felt like I was waiting for it as I turned every page, only to be denied. It also felt like the story was a few pages too long as if they asked Richard to add just a little bit more to the tale. 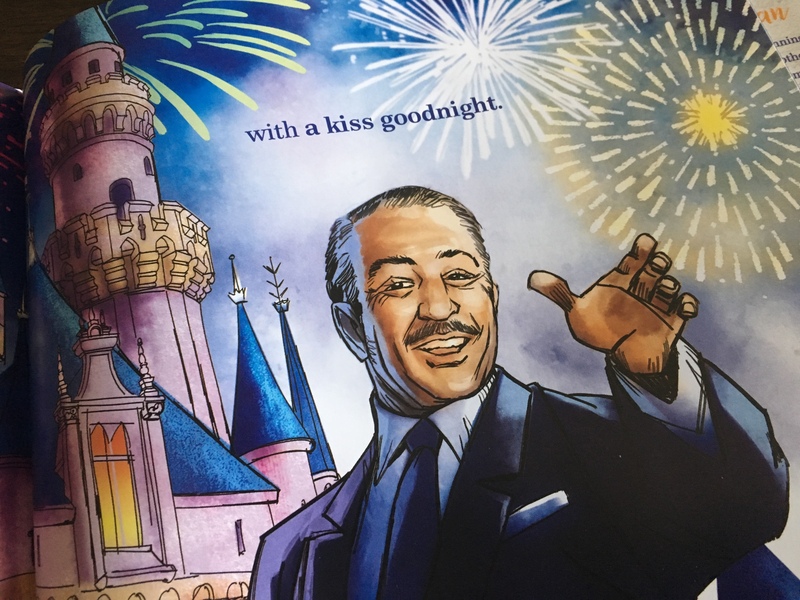 Regardless of those two details, this book is a treasure – as much a piece of Disney history as the fireworks themselves. If you love Disney and the Disney theme parks, this book will only make you enjoy them more. A Kiss Goodnight is being release on August 22 but is available for pre-order now. definitely looking for this book! Previous Previous post: Amazing Cosplay at D23 Expo!